Before the advent and widespread use of electronic key control systems, key control was often a haphazard routine. Many organizations used an honor system to store and control building keys, while institutions such as correctional facilities or medical campuses used a more formal system requiring access activity to be hand-written in a log book. The procedures were often ineffective, mostly laborious and frequently left the organization exposed and vulnerable because keys could not be one hundred percent accounted for. Electronic key control systems resolved these challenges with the implementation of authorized user codes and automatic tracking of key access activity. The automated systems made it easy for users to access or return keys with illuminated key slots and return anywhere features and for management to better control and track key usage with online monitoring. Further, the electronic key control systems could be integrated with other building security systems such as access control and video surveillance. Now, an individual trying to leave the building without returning a key to the key cabinet could be denied exit with their access card and, prompting an email alert to security. Today, the most advanced key management solutions have even more of a convenience factor while maintaining simplicity of use. Time-saving features include the ability to return keys to any key cabinet in the enterprise; a friendly interface with large buttons; and a 7″ touchscreen display offers step by step instructions for accessing or returning keys. For added convenience, the system can locate which key cabinet a specific key is in, or determine who has it out and when it will become overdue. The new key control systems also feature advanced communication capabilities and versatile, scalable installation options with custom designed configurations. 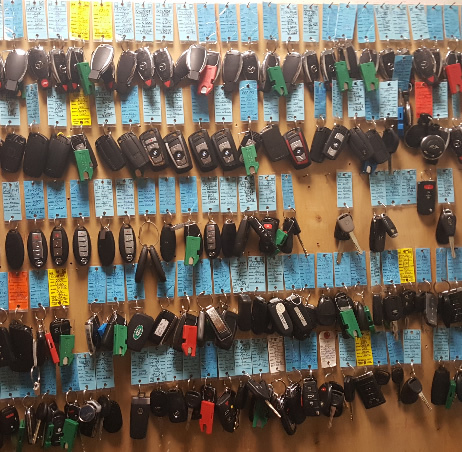 Compared to the old, dog-eared logbooks, today’s key control solutions have made the task easier in addition to making it more reliable.